Zeitgeist is a collection of 8 gorgeous web pages that you can create with a single click from inside a special interface that runs inside Dreamweaver. 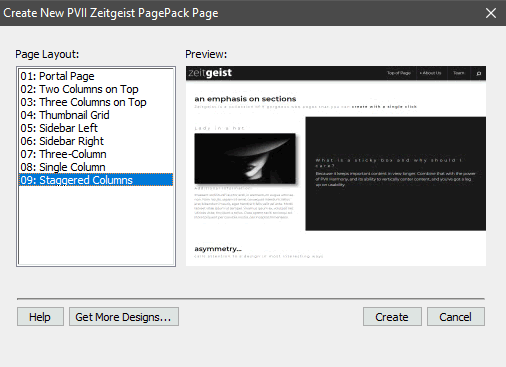 Zeitgeist is a PVII Page Pack, a product that installs into Dreamweaver, giving you a visual and automated means to create fully-styled pages with a single click. The Zeitgeist user interface allows you to choose among 8 different layouts. Once you create your page, you can manage its content statically, with server-side or PHP includes, or by using Dreamweaver's built-in Template features. The choice is yours. 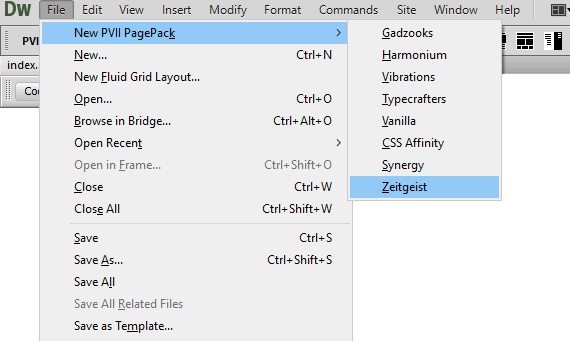 Zeitgeist pages come with menus powered by Adaptive Menu Magic (AMM). They are fully functional, responsive, and mobile-friendly. We provide a single menu that can be easily edited manually to add or re-order links. The menu is contained, along with the logo, in a 2-column Harmony instance at the top of the page. This Harmony instance is set to position: sticky so that the menu always floats on top of the page, always visible and accessible. Adaptive Menu Magic is also priority-based. This means that the menu will never wrap to more than a single line. Instead, a dynamic menu item called "More" will be created and any menu items that do not fit in a single row at the root level will be moved to the "More" link as child (drop-down) items. The bottom line is that AMM menus always fit. We regularly issue updates to address emerging browser issues, bugs, and also to add or enhance features. Critical updates are announced via email. For scheduled updates, please check our home page regularly for a listing of updates, or go straight to our updates page. Compare the version number of the update to the version number of your installed product. Versions are included in the product file name, as well as in your Dreamweaver Extension Manager. 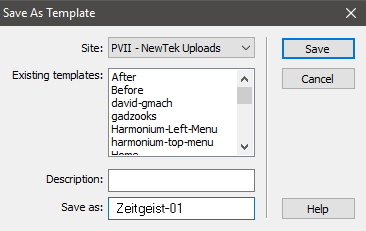 For instance, a product file named p7_Zeitgeist_103.zip indicates version 1.0.3 of Zeitgeist. When creating a Zeitgeist page, you should remember that you are not performing this task on an existing page. You are creating a new page. The act of creating a Zeitgeist page will not affect any other Dreamweaver documents that might be open. After you create your Zeitgeist page, there is an important decision you should make. If you wish to manage site-wide repeating content, such as mastheads, logos, navigation menus, and footers, you need to use some type of site-wide management technique. The most popular method for Dreamweaver users is DWT (Dreamweaver Template). With Zeitgeist, it's easy to set up. In most Zeitgeist layouts, there are 3 separate Harmony instances. Each instance's root DIV is assigned an ID: p7HMY_1 (Navigation and logo), p7HMY_2 (main content), and p7HMY_3 (footer). The only exception is the Team directory page (Layout-04), which has an added Harmony instance to house the team member photos in a grid. The content area is always going to be p7HMY_2 or, in the case of the Team Directory page, p7HMY_2 and p7HMY_3, and that's the area we want to wrap inside of an editable region. Note: If using the Team Directory page, make sure you have selected both the p7HMY_2 and p7HMY_3 elements. Note: position: sticky will not work if the element, or any of its parents is set to overflow: hidden. in Layout-04, including animating the images on hover. The first three rules are descendant selectors, based on the team-grid user class being assigned to the Harmony instance that houses the grid. The last two classes are utility rules to allow you to set specially styled captions and descriptions above or below your images. 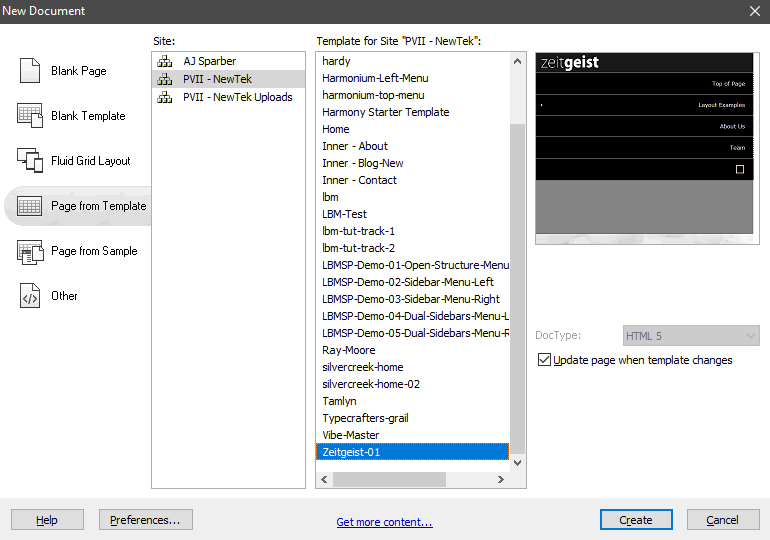 The Adaptive Menus included with Zeitgeist can be edited two ways. If you own Adaptive Menu Magic, you can simply open AMM and every facet of menu management can be accomplished quickly from within an automated UI. If you would rather not purchase AMM at this time, you can edit your Zeitgeist menus manually. Zeitgeist menus use the Adaptive Menu Magic scripts and CSS to provide extensive functionality, including fixed positioning on page scroll, current link marking, an menu prioritization with a generated More link when needed to prevent root item wrapping. Note: If you use the AMM UI, do not enable the Fixed Position on Page Scroll option. The menu is already fixed at the top, controlled by position: sticky on its parent Harmony header element. It has User Classes of popper and scs-noscript, and an ID of popper. Note: If you decide on another use for the Pop Down, you can change the character entity or substitute a plain text link. If you change it to a text link, make sure to remove the search class. The search, scs-noscript, and the character entity (&#8981;) that renders the icon are all entered in AMM UI (if available). The data-scs attribute, call on the included p7SCSscripts.js file to toggle an additional class of show-popper on the element with an ID of popper when the icon is clicked or tapped. This is how the Pop Down is shown and hidden. 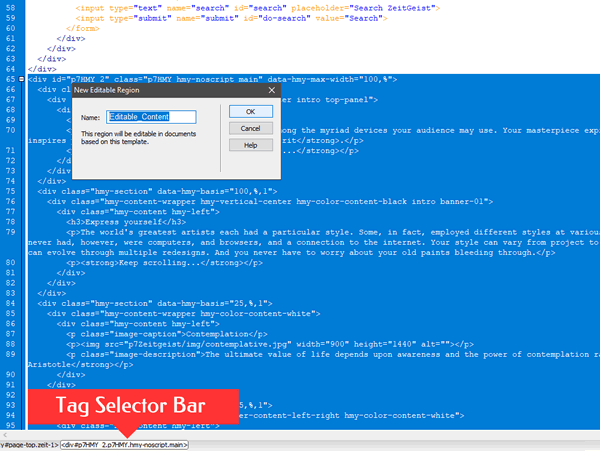 The Pop Down box can be used for other purposes than a search form. The box's content can be edited in Design or Code Views. In the event you want to remove the Pop Down, simply delete the menu item housing the search icon and use the Harmony UI (if available) to remove the popper column. 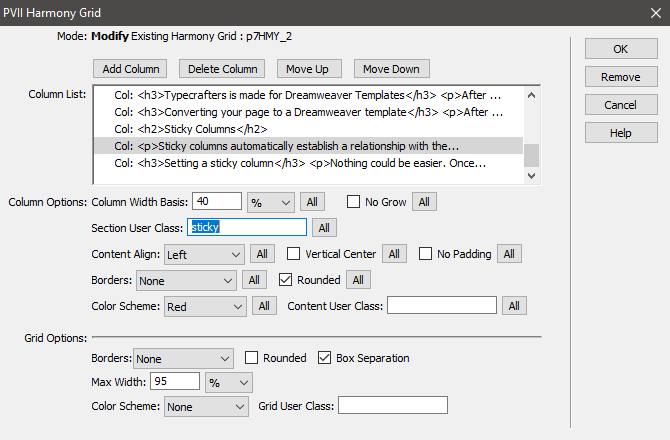 If you are using Harmony, then changing column colors, adding borders, rounding corners, and much more, are tasks you can accomplish in the Harmony user interface with just a few clicks. If, on the other hand, you are using Zeitgeist without benefit of Harmony, then you probably have a decent-to-advanced grasp of CSS. If you want to learn how the pointer arrow that appears when a sub-menu opens in the main navigation bar, look it up! Note: To banish the Find and Replace dialog simply click the Close button. Needless to say, reading the entire style sheet is a very good idea. In fact, we would recommend printing a copy and using it as a reference. Zeitgeist uses a free Google font called Montserrat. Feel free to change the weights used, but be sure to limit yourself to the weight choices listed in the Google font link.